It’s definitely a work in progress for us! When we started this blog, we used our old point-and-shoot cameras to capture pictures of our meals . . . we really were only photographing our food for each other because we never thought that anyone else would look at this blog. it’s still so hard to make food make in the crock pot look appetizing. It tastes amazing, but it’s just so hard to make it look good! So even though the chicken/pepper/onion mixture in the tortillas might not look that good, I promise that it’s absolutely divine! Spray slow cooker with non-stick cooking spray. Place all ingredients in slow cooker and mix gently, until all spices are incorporated. Cook on low for 4-6 hours or high for 2 hours. Serve with tortillas, shredded cheese, pico de gallo, and guacamole. Be sure to stop by FamilyShare.com for tools and ideas to help you strengthen your family! They share solutions, how-to’s & answers for families- including parenting, pregnancy, marriage, home, recipes, baby, health, vacations, family finance, values, children, and love just to name a few. Fajitas are one of my favorite meals of all time! They're so great because they are healthier than a lot of other foods but still taste great! Thank you for another great recipe I can try! You are too hard on yourself-- the photo looks nice! The peppers in the background add color and I like the way you put the name of the food right on the photo. I'm ready to eat your fajitas now! Camille, I completely understand the dilemma with making crockpot food look good. Actually none of my dinner dishes look good all winter season because of the lack of lighting (which is why i seemingly only post desserts and snacks on the blog during that time). Regardless, I think it looks great! I just bought a fancy camera & I am trying to figure it out. Haha. But yes, crockpot dinners & casseroles are the hardest to photograph! I think this still looks delicious! Just stopped by to let you know that I featured your M&M Blondies on my round tuit post this week! 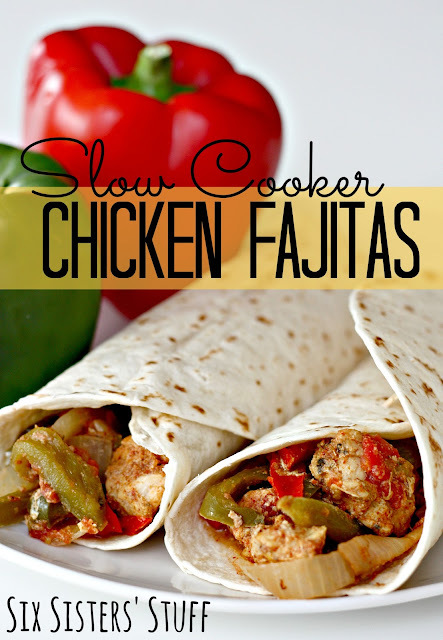 Will be making these this week since I have to make slow cooker meals all week with the start of 5:00 swim lessons. Thanks! I've got all the stuff for it! I think the fresh vegies would work great! i think its an awesome photo! :)yummy. These looks awesome!! Thanks so much for sharing in Simple Supper Tuesdays. Mmmm...looks so yummy! I think your picture looks great! We love fajitas around here and I love the idea of making them even easier by cooking them in the slow cooker. I made this for dinner yesterday, and it was easy to make and wonderful! My husband and both boys were in love with them too. I will be making these again soon. These really good... Like surprisingly good!! Thanks for the recipe!! Do you drain the tomatoes or green chilies? Don't drain the tomatoes or green chilies. You will need that liquid in the slow cooker. Just be sure to use a slotted spoon when you dish it out and put it on your tortilla. This looks delicious! And I agree that the picture is great, which is why I want to make this. I just had two questions. 1) How many servings does this recipe usually make? 2) If I froze the ingredients ahead of time, is the crockpot cooking time the same? Thanks! Makes about 12 fajitas. If you have big eaters, they will want more than one. If your ingredients were frozen when you put them in your slow cooker it would take a little longer because they would have to thaw as part of the cooking time. Not exactly sure how long that would be. Just watch it closely. I'm addicted to your website and telling everyone about it lol... tonight I'm trying these and so excited. My only question is I'm planning on just using a can of rotel instead of tomatoes and chili's any opinions on that?? We are cooking this meal for dinner. It looks so luscious. I have a question, though. Can you freeze this as a freezer meal? You could easily freeze the chicken mixture before or after cooking as a freezer meal. You could prepare the chicken mixture and instead of placing in the slow cooker, put it in a freezer bag. Then thaw and cook when ready. Or you could prepare the whole recipe, then freeze any leftovers. Thaw and reheat when ready to serve.